Find Vending related VENDING MAGAZINE & PUBLICATIONS listed below, in alphabetical order by company name. Please contact these publications directly for more information and concerning subscriptions. You might be able to purchase a copy or view digital online. Also including: ATM, Business Opportunity, Entrepreneur, Micro Markets, OCS, Laundry. Auto Car Washes, All Vending Types of Self Service Industries USA & International. 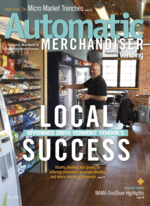 ATM Magazine is an online Magazine for the Automatic Teller Machine Industry. ATM’s and Self Service ATM Kiosks. Auto Vending is the leading monthly journal covering all aspects of the UK vending industry as well as major international events. Always the first with industry news and well known and respected for its in-depth features and market sector reviews, Auto Vending is an essential read for the trade and specifiers of vending equipment and services throughout industry, commerce, health, education and leisure. Over 50 years serving the vending and office coffee service industry Automatic Merchandiser serves the business management, marketing, technology and product information needs of its readers including vending operators, coffee service operators, product brokers, and product and equipment distributors in print. Automatic Merchandiser has a qualified circulation of more than 14,600, including the presidents, owners, corporate management, front office personnel and route management personnel. Free Subscription Application! Candy Industry Magazine for the Candy Industry. Coin Laundries– “Road to Financial Independence” Hard back book. Entrepreneur Magazine – Stay clued in on essential business news, Business Start ups and trends for entrepreneurs. Gameroom Magazine – America’s ONLY Pinball & Coin-Op Collector Magazine, since 1989! Play Meter Magazine – The #1 trade magazine for the coin-operated entertainment industry! trade journal for the coin operated amusement route, arcade, FEC & LBE owner, published since 1975! Specialty Food Magazine – Reaching more food professionals than any other specialty food industry publication, Specialty Food Magazine is also the fastest growing advertising vehicle in the industry. And, as the official publication of the Fancy Food Shows, Specialty Food Magazine has the strongest Show coverage and distribution. StarTech Journal – The Technical and informational Monthly for the Coin operated Entertainment industry. Covering coin op games since 1979. Service Manuals, Tech Reports and an information exchange forum. The JOURNAL is the industry’s #1 publication! Published monthly by the Coin Laundry Association, The JOURNAL is packed with the information you need to become a more successful coin-op laundry owner. 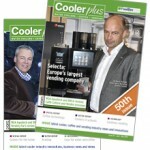 Vending Report – The leading vending business Magazines in Europe. We offfer vending magazines for 7 differnet European Countries! VENDING TIMES addresses the business, legal, legislative and regulatory concerns of companies providing industrial, institutional and public vending, refreshment, feeding and recreational services. These companies include operators of food, beverage and other merchandise vending equipment as well as manual foodservice; office beverage and snack delivery systems; and music and amusement equipment and services. We are published 12 times a year: 11 tabloid-size issues and one standard-magazine format. Each issue incorporates the annual Buyers Guide, and many issues include the Census of the Industry as a supplement. Each monthly issue includes sections presenting late news, interviews and coverage of industry events in the Vending, Coffee Service, Music & Games and Bulk Vending sectors; Financial news; and Calendars of trade shows.